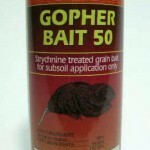 PRODUCT DESCRIPTION: Strychnine treated grain bait for pocket gopher control. Subsoil applications only. Insert one tablespoon of bait into the gopher burrow system. One pound of bait will treat one to eight acres. See label for complete directions.